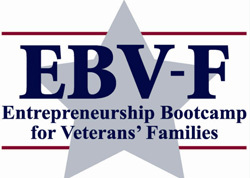 In concert with National Military Family Month, the Entrepreneurship Bootcamp for Veterans’ Families (EBV-F) has welcomed 17 participants to the second annual program on the Syracuse University campus. The program began Sunday, Nov. 13, and runs through Sunday, Nov. 20. The EBV-F provides a vocational and economic path forward for military family members who now find themselves caregivers to a wounded warrior, and surviving spouses of servicemen and women who gave their lives in service to our nation. Sixteen women and one man, all military family members and/or spouses of veterans representing all branches of the armed forces, are taking part in the EBV-F. The eight-day residency includes exposure through course work, lectures and keynote speakers to accomplished entrepreneurs, academics, disability experts and business leaders from across the country. The EBV-F experience is intense; a typical day for participants in the program begins at 7:30 a.m. and ends at 10 p.m. Founded in 2010 at SU’s Whitman School of Management and operated by the University’s Institute for Veterans and Military Families (IVMF), the EBV-F is part of the Entrepreneurship Bootcamp for Veterans with Disabilities (EBV) portfolio. These programs open the door to business ownership to America’s veterans and their families by providing cutting-edge, experiential training in entrepreneurship and small-business management. The next session of EBV-F will take place at Florida State University in February. It is FSU’s inaugural EBV-F program.